← My story “Crawl” now available in TRICKS AND TREATS, signings slated, check out the trailer! The Kipling Carriage House. It was originally (obviously), where the carriages were kept, and we think that the kitchen was probably an add-on, although it was well integrated. According to the Landmark Properties, it was converted from a Carriage House to living quarters at some point. It is nicely modernized now, and the flow of the place feels organic. Quiet time. It’s probably what’s most sought after by writers in terms of creation, next to, of course, inspiration. Sometimes, being at home in the middle of life—even if you’ve got an office or favorite spot to which you can retreat—isn’t going to give you either thing. There’s always that phone call, that pile of dirt in the corner, that lawn that needs mowing, that commitment you made to go out with a friend. It’s why every writer should have at least one writer’s retreat—even if it’s just a weekend—a year. 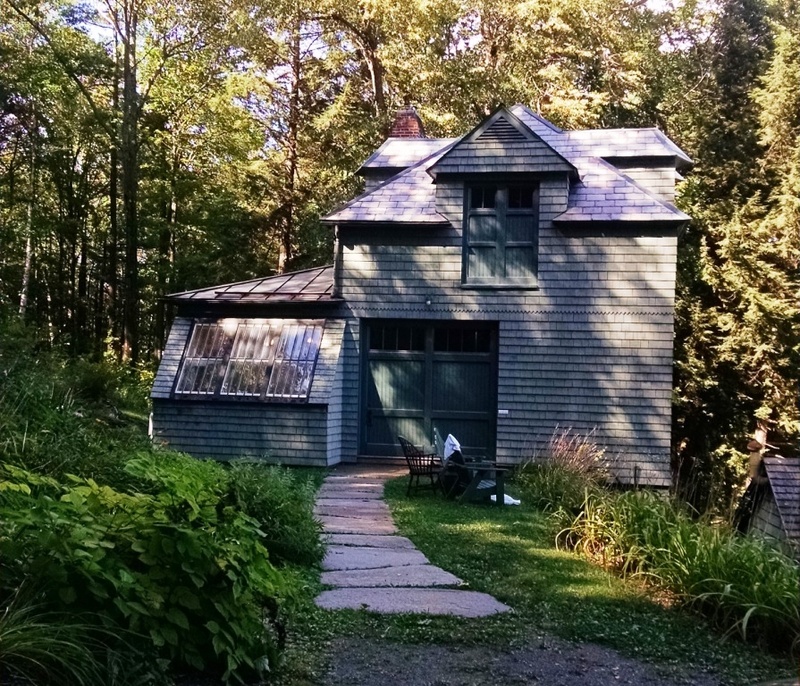 The private writing time I’ve been able to enjoy up at the Norman Mailer house in Provincetown, The Fifth House Lodge in Maine, and in a cottage in the Catskills has yielded countless short stories as well as a novel, and it’s also restored and refreshed my creative soul. All of that said, it’s not easy to find the perfect spot that meets your personal criteria. For me, number one is choosing souls that are on the same page (Rumi once noted “Seek those who fan your flames” and he couldn’t have been more spot-on). Other than that, it’s the space: it has to be comfortable, not too far from home, and reasonably priced. I’m happy to say that I’ve finally found a fantastic retreat spot that meets all of those criteria—and what makes it extra special? It was Rudyard Kipling’s! The Landmark Trust, U.S.A. operates a handful of historic properties in Vermont, and each is available at reasonable prices if there are a few of you. We chose to stay in Rudyard Kipling’s Carriage House (right next door to his actual home, which sleeps up to eight people) which, priced at $275/night, was affordable for the three of us—and all monies go right back into maintaining the buildings. We were impressed by how clean and beautifully maintained it was, and also discovered on our trip that Landmark Trust is actually worldwide—yes, you can rent castles in England, seaside cottages in Scotland, and more. So if you don’t want to stay close to home, it’s definitely worth looking into! I think this is a genius way to ensure there is money to take care of our historic structures. The entrance. This is probably the “wall” of the original carriage house…the new kitchen is to the right. The kitchen! It’s pretty gorgeous, and a great place to cook with plenty of room. There’s no microwave, though, so if you’ll need one to eat, this place isn’t for you. We found not having a microwave was much more fun. I decided to write on the dining room table…whenever I walk into a retreat, I know the spot that calls to me. I had a feeling I’d be writing in this spot the second I saw a professional photo on the website. Stacey’s spot in the living room, which is probably the most original part of the house. Meghan’s writing spot, which was upstairs in her bedroom. I have to admit, I was jealous of this spot. I always love having a window to either the left or right of me when I write. The bathroom. It’s gorgeous. The end. The view from the bed in my room. This was the view I had while I was reading a really bad story in The New Yorker (yes, the New Yorker actually publishes bad fiction that has no character arc). Our first night! Photo by Meghan Guidry. A typical sunset. We saw this every night at cocktail hour. There was nothing more soothing to the soul. Photo by Meghan Guidry. Bought these at the gas station at the roundabout! From left: my magnet, Stacey’s magnet, Meghan’s magnet. I’ve just booked our retreat for 2017! Photo by Stacey Longo Harris. Posted on September 27, 2016, in The Writing Life and tagged cottages to rent in the mountains, Landmark Trust Properties U.S.A., Meghan Guidry, Rudyard Kipling house, Stacey Longo Harris, what's a good place for a writer's retreat, writers retreats in Vermont. Bookmark the permalink. 2 Comments. I remember Meg from Boston when she was involved in the readings with Dawn but then I never saw any of them again when the readings stopped. I’m glad you found a spot. I love Vermont. I wouldn’t want to go “retreat” with other humans, though. Doesn’t that defeat the purpose? Other humans already get on my nerves. Too noisy! Me and Puzzle just by ourselves holed up in a hotel for an ENTIRE MONTH. I’m looking into it, Kristi. I got some leads, too, just today. Hotels are built sound-proof, did you know that? Gimme that any day! Most have desks (or little tables) and outlets, too.